Sigma is the largest independent lens maker in the world and produces a number of specialist lenses outside of those normally found in the ranges offered by the camera marques. This lens is one of those models. As a full-frame lens it’s a tempting addition for anyone looking to capture elusive nature and wildlife and may even be a useful addition for sports and action. This lens is particularly attractive, however, when used on an APS-C body, where it has the equivalent field of view of a stabilized 75-750 mm. 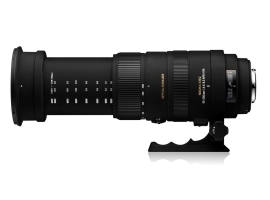 As usual with Sigma, it has a highly promising specification. In addition to an ultrasonic type AF motor for fast near silent focusing and built-in four-stop stabilizer, it has no less than four SLD (low dispersion) glass elements, a rounded diaphragm consisting of 9-blades and focuses down to 0.5m at 200 mm. Although the filter thread is a sizeable 95 mm, it measures 218 mm in length (un-extended) and weighs in at 1.96 kg (4.33 lb). 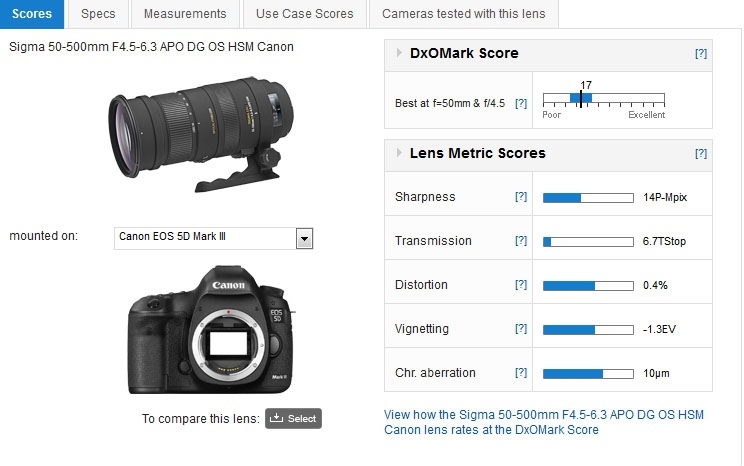 Sigma 50-500 mm f4.5-6.3 APO DG OS HSM Canon: how does it rank in our database on the full-frame Canon EOS 5D Mk III? Inevitably, some compromises are made in a lens with a 10x zoom range like this, but given the price and performance it may be an attractive option. Note new and old versions are listed. Compared against models in our database with a 5x zoom ratio or more the Sigma performs well, particularly with regard to sharpness. 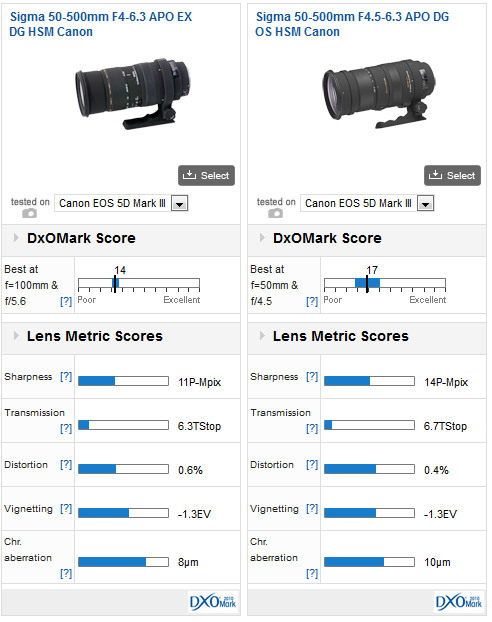 With an overall DxOMark lens score of 17 points, the Sigma lens behaves very well given the large zoom range and long focal lengths involved. It has a surprisingly high sharpness score of 14P-Mpix, though like many models it’s sharper at the shorter end. Sharpness is somewhat inconsistent across the zoom range but, fortunately, it’s still good at the longer focal lengths. Distortion and vignetting are both low, as expected in a lens like this, while the low-dispersion glass has kept chromatic aberration down to reasonable levels. As we’ve not yet analyzed the Canon EF 100-400mm f4.5-5.6L IS USM, the closest lens from Canon, we’ve taken the opportunity to compare this model with its forerunner, the slightly brighter 50-500 mm f4.0-6.3 Apo EX DG model. Although the current model was introduced with a price premium of around $200, it is a substantially better performer in terms of peak sharpness. However, the earlier model had far less variation is sharpness throughout the zoom range. In most other respects the results were similar, though the new lens has notably lower levels of distortion. Given the extra magnification the Sigma is an attractive option, and it’s ideal for a number of applications including wildlife and sports, providing high ISOs may be used. Although we’ve yet to assess the similarly priced Canon EF 100-400mm f4.5-5.6L IS USM, the Sigma is a good performer and has the more useful zoom range of the two.